Within every consenting partner on Whisk’s platform (this includes recipe publishers, IoT apps like Samsung and users of Whisk’s APIs). There are over 1m pages receiving 100m monthly impressions where your store may appear. 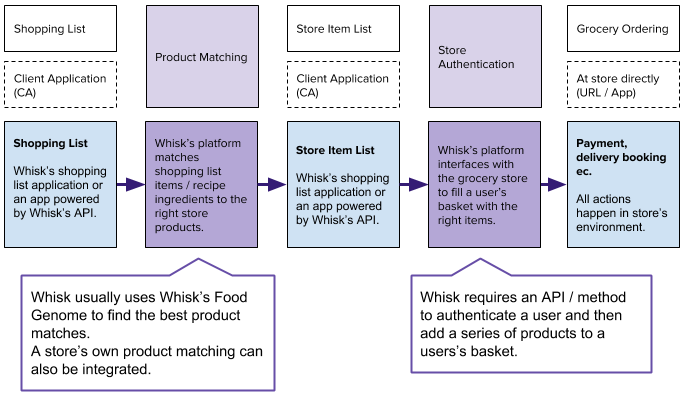 Product mapping: Products are mapped to Whisk’s internal ontology which allows Whisk to display the correct store products against shopping list items. Authentication: A link between Whisk and the store to allow users to fill their store baskets with a number of product IDs. There are two components to the integration: 1. Product Matching and 2. Store Authentication. 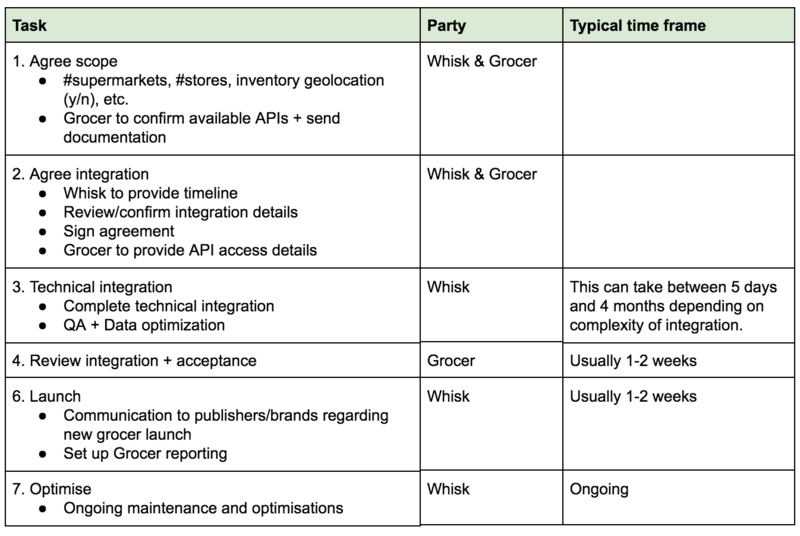 Whisk uses two methods to map store products to ingredients. Product mapping: Most shopping list line-items have multiple possible products from retailers, so Whisk selects defaults based on algorithms which select “best matches”. These are based on the most appropriate product for an item in a user’s shopping list based on: Item required (what’s closest), quantity required, attributes (e.g. organic, fresh, frozen), price, personal preferences and other attributes. Whisk’s interface allows users to switch the default choices. If a store has their own product matching capability, this can be used instead. This typically allows Whisk to pass in a simplified ingredient (e.g. “<5>, <Carrot>” instead of “5 carrots cut into small pieces and washed”). It may also allow Whisk to authenticate a user in order to use their store loyalty scheme to find personalised matches based on a user’s in-store purchases. Whisk uses two methods to authenticate supermarket. This integration method is preferred because it’s (a) more stable, (b) is faster to integrate and (c) requires no login from user once the store transfer is complete (the user can land on a pre-logged-in store page). This integration method requires a user to login at the store once the items have been transferred. The user is not automatically logged in on their device. If a partner wishes to mitigate security responsibilities involved with step #1, Whisk can provide it’s authentication interface directly in the CA, both the turnkey (via iFrame) and API (via OAuth) integration.